THANK YOU to everyone who voted for me! I made it to the FINAL round. Can you take a quick second and vote again? THANK YOU! Soft, chocolate almond fudge dipped in white chocolate. Need I say more? I was recently asked by Solo Foods to be a part of a recipe competition. They sent a few cans of pastry filling and a can of almond paste and asked me to create a recipe using at least one of these items. Of course, my mind always goes to fudge. I know, so predictable. I realized that I don’t have very many chocolate varieties on my website here, so many other flavors have made appearances, but not chocolate. I had been wanting to do chocolate almond, so why not try incorporating the almond paste? Can I just say, this was a great move. It gave the fudge a deep almond flavor (more than just extract could do) while enhancing the creamy texture. Two thumbs up! AND, this recipe makes 81 bites of fudge. 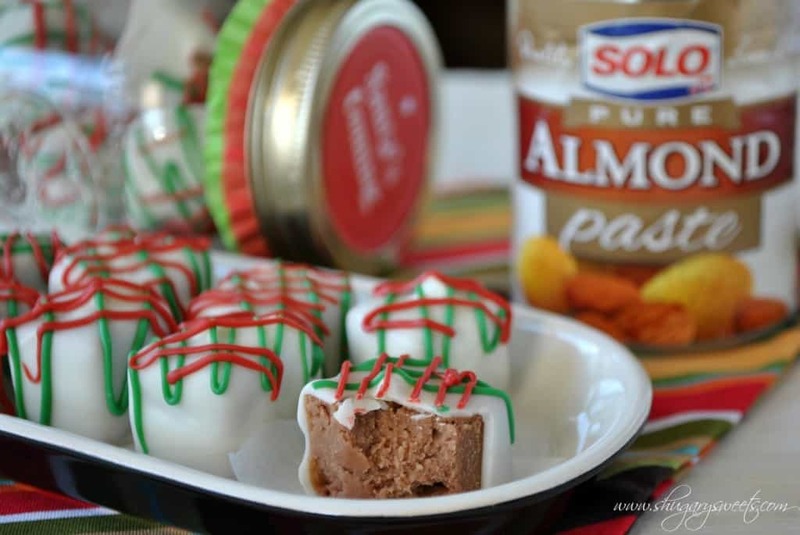 You can make it now and freeze it for the holidays! 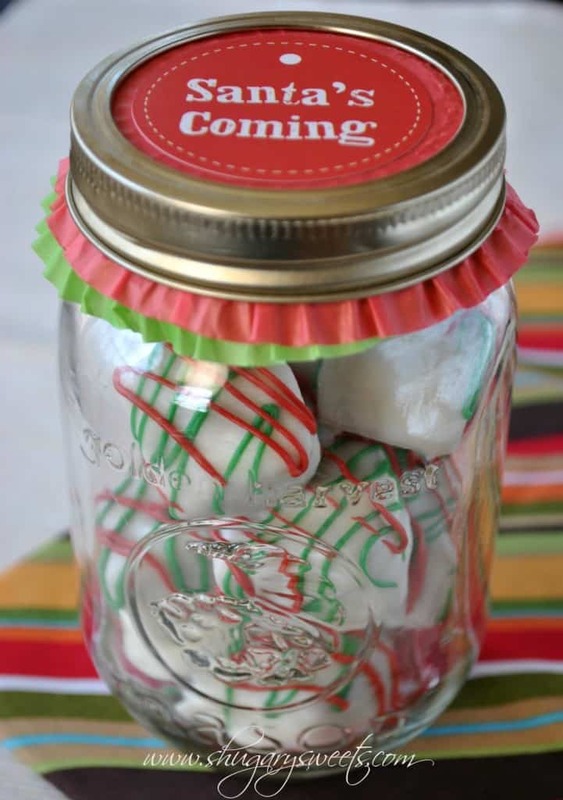 Or give as gifts in cute little jars with tags! If you think you’d like this recipe, would you mind heading over HERE to vote for it? I don’t like to solicit votes often, but I’d sure appreciate this one! It’s a march madness style of voting, with eliminations and new match ups…with the winner receiving a prize of $500. How perfect right before the holidays! Thanks in advance, you all are simply the best! Prepare a 9x9 baking dish by lining it with parchment paper. Set aside. In a mixing bowl, add milk chocolate morsels, marshmallow creme and Pure Almond Paste. Don’t mix yet, just set aside. In a large saucepan, melt butter with sugar, cream and pinch of salt over medium high heat. Bring to a boil. Set timer for 5 minutes and allow mixture to boil, stirring constantly. Remove from heat. Add almond extract. Pour boiling mixture over chocolate morsels in mixing bowl. Whisk until smooth and creamy, may take a couple minutes. Pour into a prepared baking dish. Refrigerate for about 2-3 hours until set. 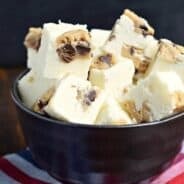 Cut fudge bites into 1 inch cubes (you should get about 81 cubes). Melt vanilla candy coating according to package directions. 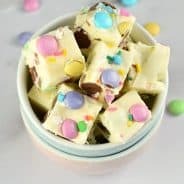 Using a toothpick, dip each fudge bite into melted vanilla coating. Place on parchment paper to set and repeat with remaining bites. Melt red and green candy melts according to package directions (in separate bowls). Place melted chocolate in a ziploc sandwich bag and snip off the corner. Drizzle onto each fudge bite. Allow to set, about 15 minutes. I store my candy in an airtight container in the refrigerator. ENJOY! 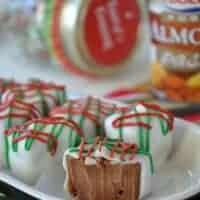 Here are some more of my favorite Almond Recipes…. 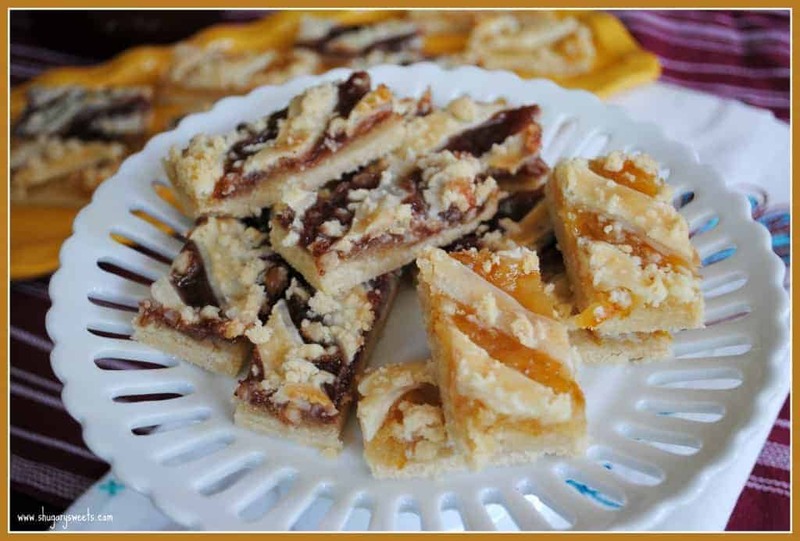 Almond Toffee – English toffee with almond and walnuts. 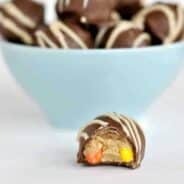 Perfect candy recipe! 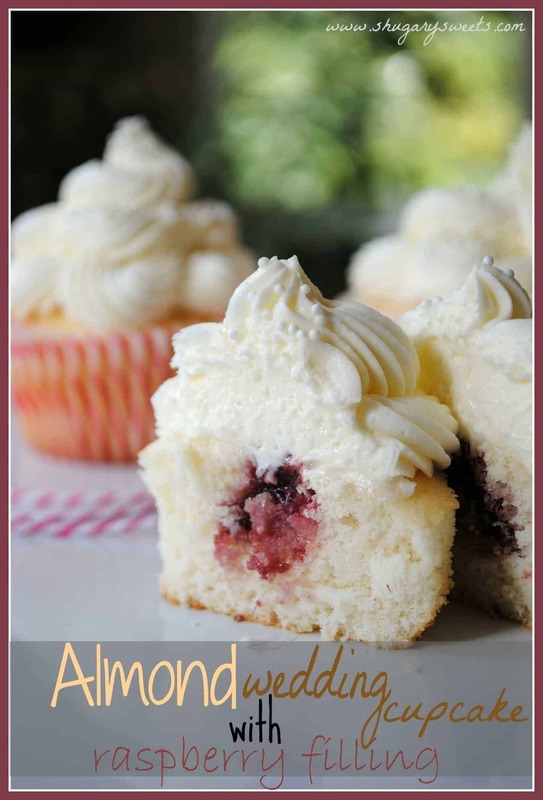 Almond Wedding Cake Cupcakes with Raspberry Filling– One of my more popular cupcake recipes- from scratch! 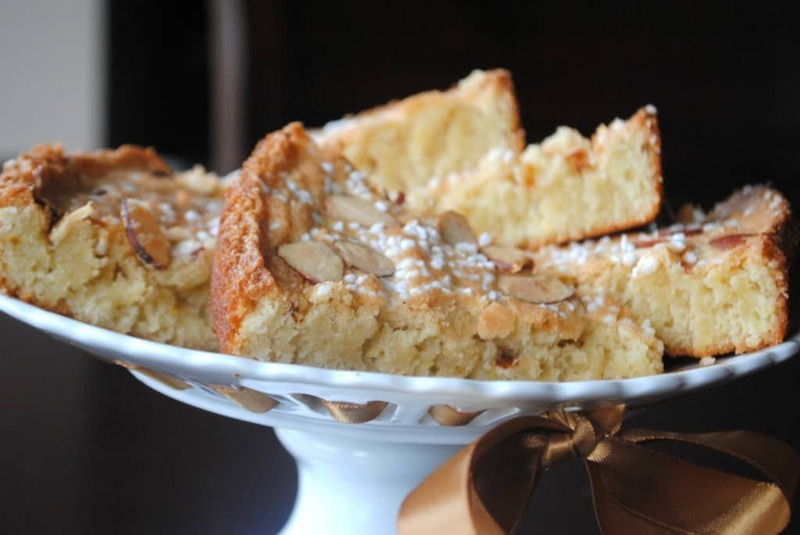 Swedish Almond Cake– a moist, yet dense almond cake; not too sweet and perfect with a friend and some coffee! **Shugary Sweets was provide free product, no other compensation was given to create this recipe. All opinions are my own! I’ve already voted! I saw your submission when I voted for Dorothy’s (Crazy for Crust). 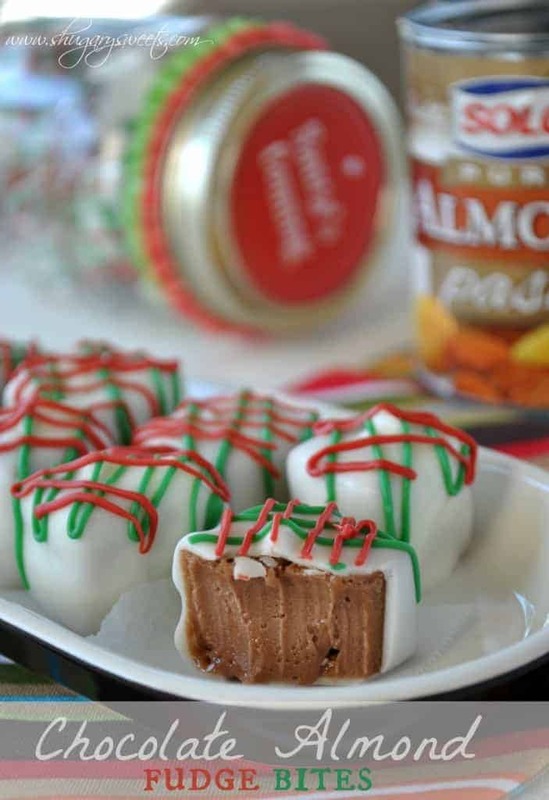 These look yummy….a great gift to give during the holidays! Have a great week! Oh my gosh, I think I need these! And I want you to have them too!! Bring on my fat pants. Yes please. What? You’re not it them already? It’s December…they go on Thanksgiving morning!! You’re at it again with the little bites and truffles – and almond paste, oh boy, this could be dangerous. Gorgeous, Aimee! Averie, I thought of you today when I posted this, and your last comment about all my fudge and truffles and candy!! You’re too sweet!!! That almond fudge looks so good I had to vote for you! Good luck!! I voted for you and how can I not? When these look so fudgy and delicious! voted. 🙂 and i have to tell you, i was checking a recipe on your blog this weekend while i was visiting my mom and my brother the chef started staring over my shoulder and after a minute or two he said “um, you need to bookmark that site for me.” i think it was the chocolate peppermint cheesecake cake that did it. Awww I love it Pam! Thanks for spreading the Shugary Sweets love!! I voted! I voted! And I love these bites, Aimee! So tender, and I am a huge fan of putting almond extract in my chocolate buttercream, so I know I’d love these little fudge bites. Yum! Yuuuummmm!! I made these and I love the flavor…but mine separated…oil floating all over the top. Any hints for me?? I’m not exactly sure what separated when you made this? I’m thinking maybe you meant you made the Almond Toffee?? If that’s true, try making sure you use a wooden spoon (if you didn’t already) and keep stirring at a constant rate! Hope this helps! Those look and sound great! I like the fact it takes almond paste; I have some I want to use. I cannot find marshmallow crime, only marshmallow fluff. Any suggestions on what to do? Marshmallow creme and Marshmallow fluff are the same thing 🙂 One is a brand name, one is generic. Now…go for it and enjoy!!! Thank you for the fast reply! It’s after 10 pm here, so I can make these in the morning! These look absolutely amazing! I never thought I’d say it but, I’m actually sick of chocolate. 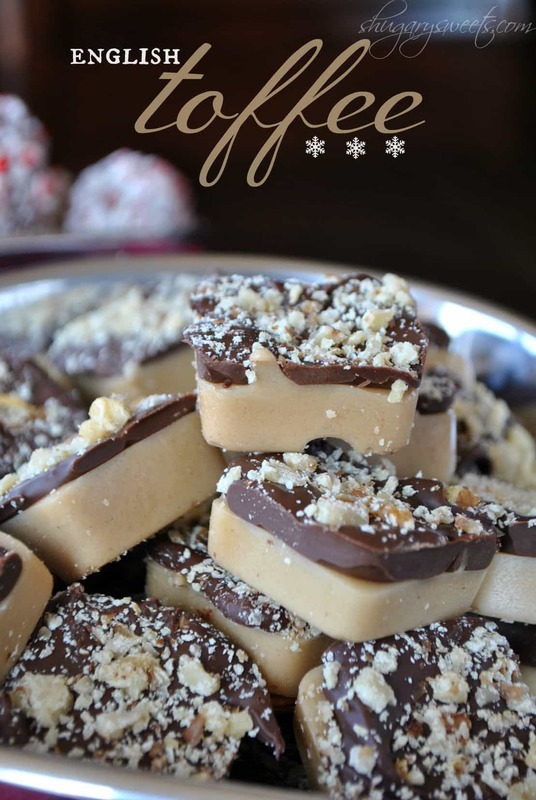 This is a great alternative to regular fudge. I just went over and voted for you. I hope you win it! Everything and I mean everything you make looks so delicious. You have given me a lot of inspiration to make different things this Christmas rather than the same old stuff. Thanks for all the goodies to make. Merry Christmas to you and your family. Thank you!!! I appreciate the kind words (and the vote). Merry Christmas to you and your family as well! Where can you find that kind of almond paste.2 years ago I looked for it all season.I finaly saw some in Jan.Then I could not find the recipe. I just looked at it and its called odense almond paste.7oz. Oh no! I buy Solo brand, and it’s in the baking aisle near the canned pie filling. I hope you find some!!! Thanks I do to.I CANNOT wait to make these. These fudge bites look really tasty, and gluten free too which is a bonus!